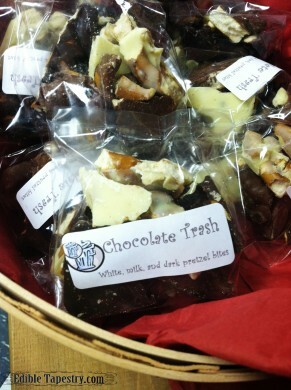 Naughty and Nice Chocolate ~ ‘Tis the Season!! 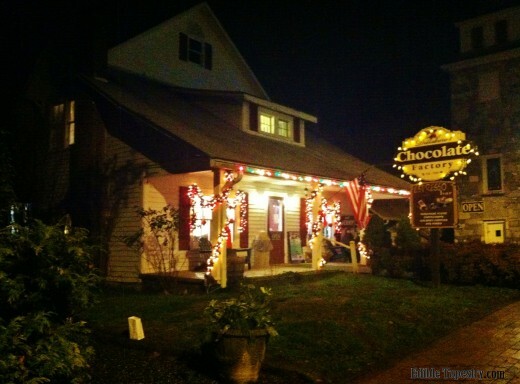 I’ve made my holiday chocolate purchases: one run to Helen, GA to buy the naughty goodies, and another to a little shop in Dillsboro, NC that we stop in around Christmas for the nice. 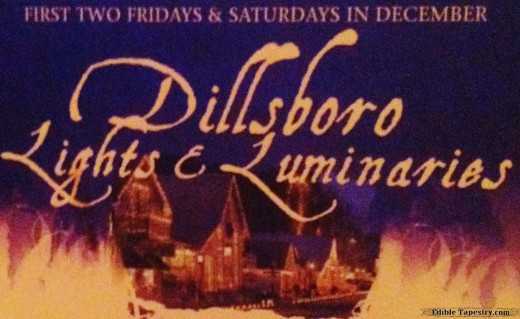 The hot cocoa we generally enjoy at the chocolate and coffee shop in Dillsboro saves our fingertips from blackening in the crisp night air and warms us through at the end of the town’s Lights & Luminaries event that we have joined in for ten years running. 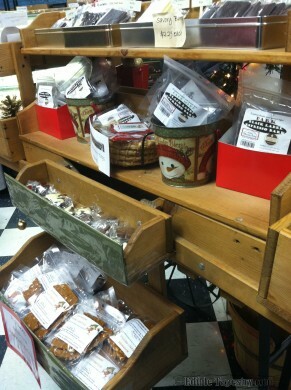 The German chocolate from Helen saves my sanity. 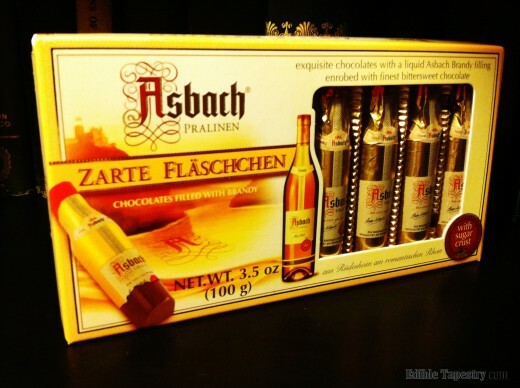 Well, there may be no hope on the issue of my sanity, but the wee, naughty, brandy-filled bottles and the chocolate beans my mother’s relatives would ship from Nuremburg each year around Christmas time, that I can now find in Alpine Helen, sure do a good job of bringing me joy each December. The fact that I can find one of my childhood favorites at the German specialty food store in Helen, Kinder Schokolade, also makes me happy. 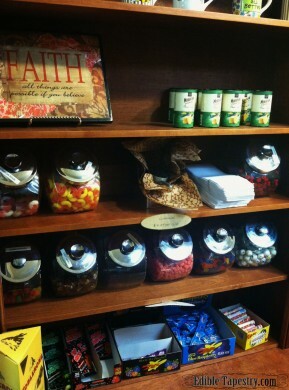 It’s nice to know that my boys will have memories of these wonderful treats as well. Milk chocolate surrounds the creamy white center of these strips of candy, rather than the dark that is common in German chocolates. 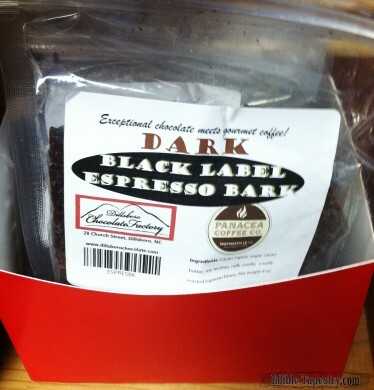 The result of this combination is better than any American candy bar concoction. It’s like eating smooth white chocolate ganache wrapped in milk chocolate so buttery it dissolves as soon as it hits your tongue. 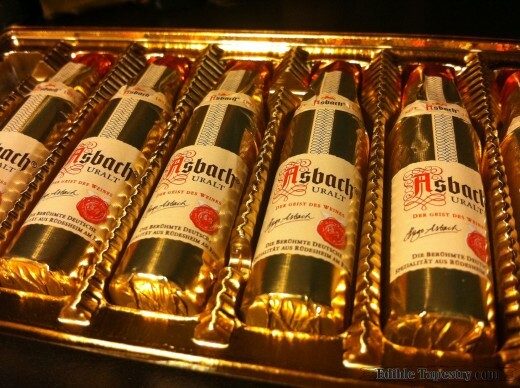 The Asbach Uralt brandy filled bottles that come in gorgeous foil wrapping are my favorite naughty chocolates. 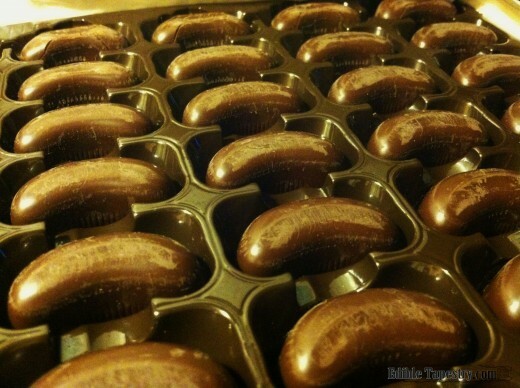 The inside of each chocolate mini bottle is coated with sugar which gives them a sweet crunch. 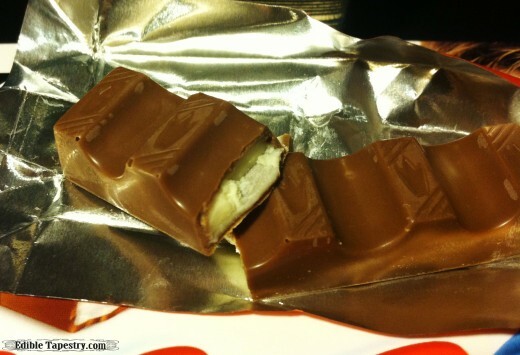 I love that crunch! 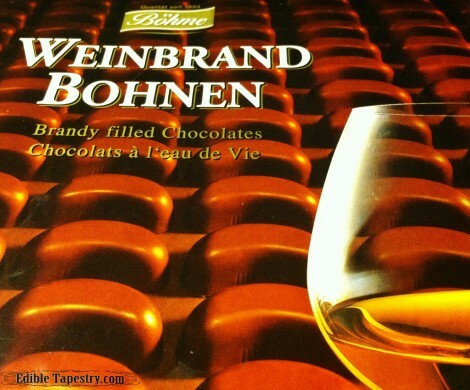 Dark, 60% cocoa chocolate makes up the shell and blends exceptionally well with the brandy that fills each. Pictured is a whole bottle and one that is open to reveal the sugary crust. 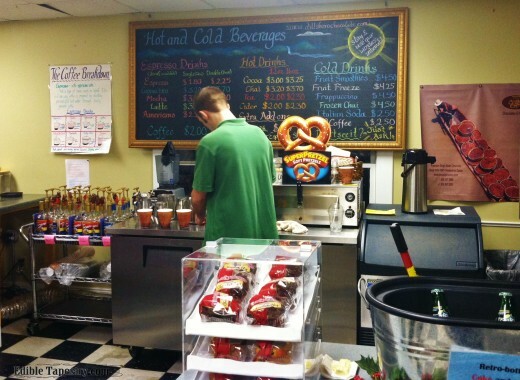 A close second is the Böhme Weinbrand Bohnen, or brandy beans, that I can also purchase from my favorite German grocery in Helen, Gourmet Shoppe. 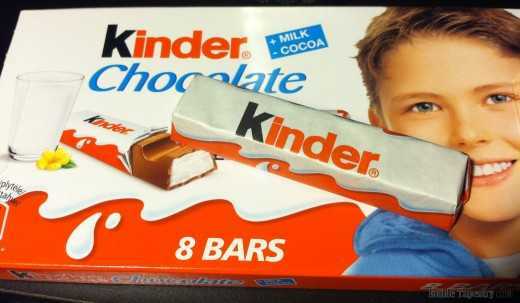 I really miss the sugar coating when I pop one of these into my mouth. 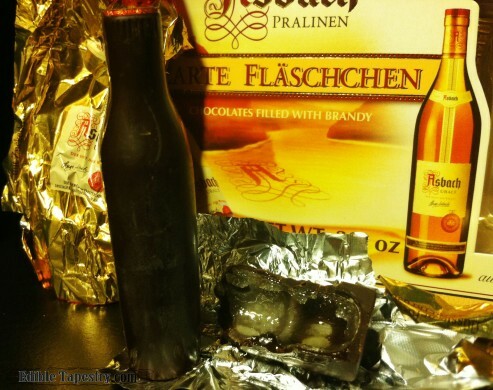 Another difference I notice right away is that the chocolate and brandy is of a lesser quality than that of Asbach Uralt’s chocolates, but these brandy beans are still very good. I can purchase a box of 40 of Böhme‘s brandy beans for around the same price as 8 Asbach Uralt’s brandy bottles, an obvious indication of the quality disparity between the two brands. 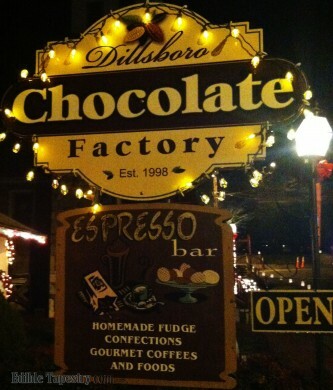 The chocolate shop and coffee house that we huddle inside of on one cold December evening each year in Dillsboro, Dillsoboro Chocolate Factory, is situated in an old craftsman style house. 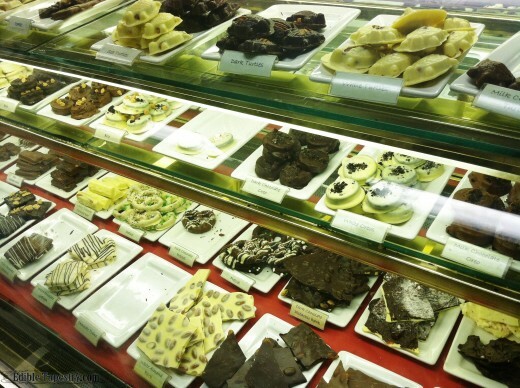 It’s a serious pleasure for an old fashioned girl like me to even have the opportunity to see inside one of the turn of the century homes that are so prevalent in historic towns, so a trip to the chocolate factory is a treat in more ways than one. 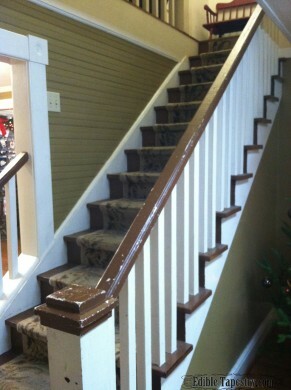 As soon as you open the front door that stands in the center of the shop’s original porch, you are looking up the beadboard lined staircase that leads to the home’s second level. 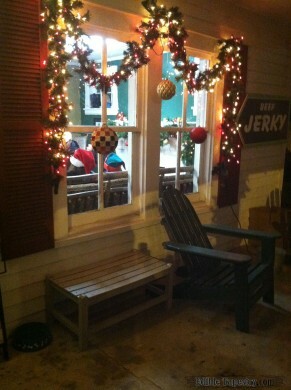 To the right is a rustic sitting room with a fireplace. 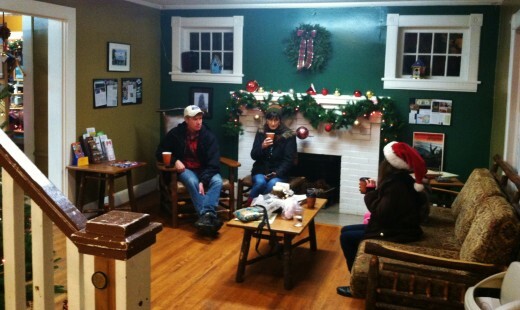 In the room on the left is another fireplace with original cabinetry. 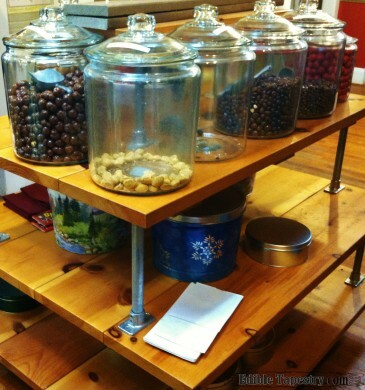 As you continue through two more rooms that flank the center of the home and are filled with chocolates and other sweets, as well as coffee beans available for purchase in several flavors, you come to a large room in the rear that, I imagine, was originally the home’s kitchen. 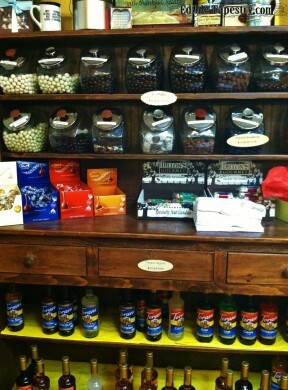 It now serves as the chocolate factory’s nerve center. 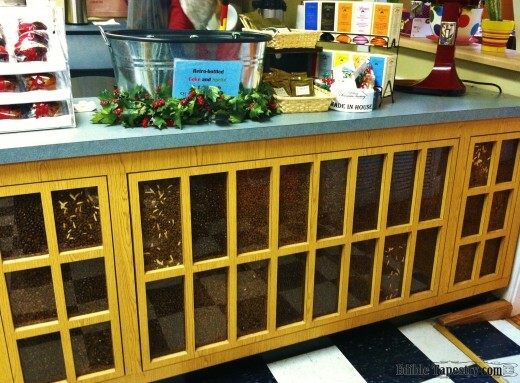 Here is where you will find cases of fudge and molded chocolates and truffles, as well as an espresso bar. 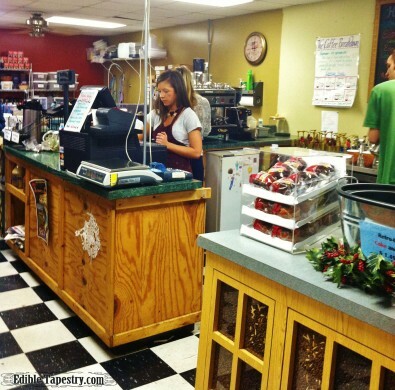 The lines are always long on Lights & Luminaries nights, but waiting to order cocoa usually gives the front room time to clear out of customers so we can rotate into the comfortable chairs and sofas that are positioned around the fireplace. Co-zy! 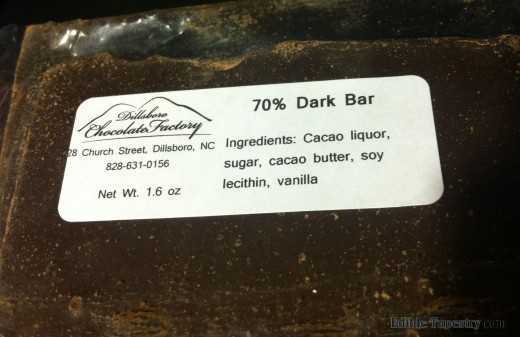 My boys asked this year, in lieu of hot cocoa, if they could purchase a bar of 70% cocoa chocolate. They love trying different dark chocolates. It must be the German in them. I snitched a corner of the one they selected. It was bittersweet, as expected, but a little waxy. I’m sure it would have been excellent for use in baking and truffle making, with other ingredients added, but it wasn’t as delicate as I like my nibbling chocolate to be. 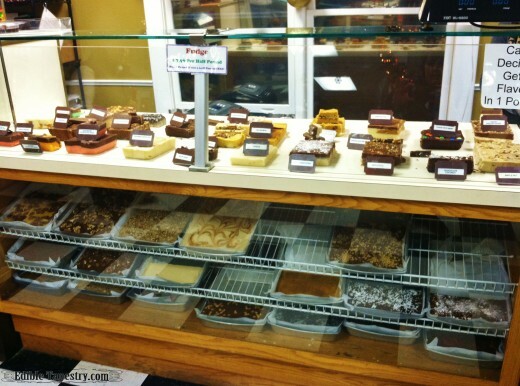 The fudge case at The Dillsboro Chocolate Factory looks amazing, as do the ones filled with truffles and other handmade confections. 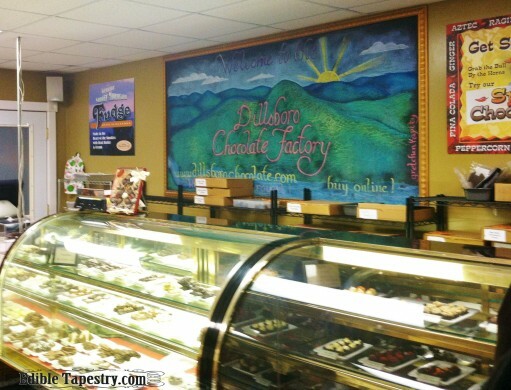 I think I need to visit more often and not just wait until our annual trip each December to sample the offerings at Dillsboro Chocolate Factory. But, in fact, I don’t need to visit to try the shop’s goodies because I can order from their site and save myself a drive to the little mountain town. How convenient! And they ship for free on orders over $75 to make gift-giving easy. I cannot order that much chocolate. Ever. That would be so naughty. 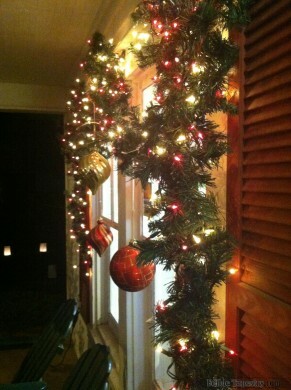 Then again, naughty is always more fun than nice, any time of year.